Why do we love dinosaurs? Obviously, people have their own personal reasons, but Gallimimus may represent the key to understanding how these long-dead animals have become so overwhelmingly popular. Gallimimus—like many fossilized beasts—is a mesmerizing blend of the familiar and the alien. Read on to find out why. 1. It Belongs to a Large Group of Ostrich Copycats. 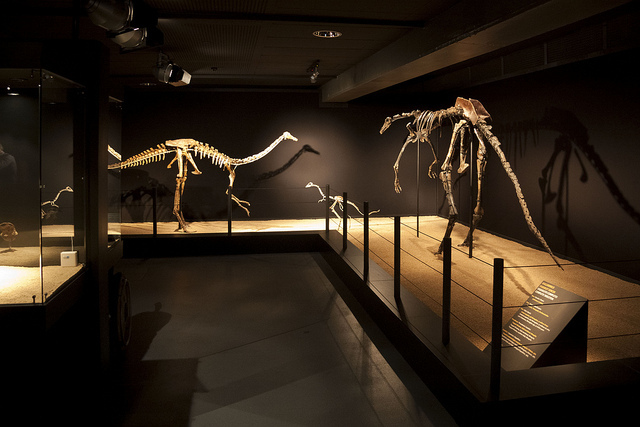 Called “ornithomimids” by specialists, these long-armed, long-necked, long-legged critters inhabited Asia and North America during the late Cretaceous period (100-65 million years BCE). Gallimimus was among the largest, although some species—as we’ll see—were probably taller than T. rex. 2. Gallimimus Had “Paper-Thin” Jaws. Thanks to research executed by Norwegian paleontologist Jørn Hurum, we now know that several of the bones in Gallimimus’ beak and lower jaw were only a few millimeters in total thickness. 3. Its Hands Were Relatively Short. 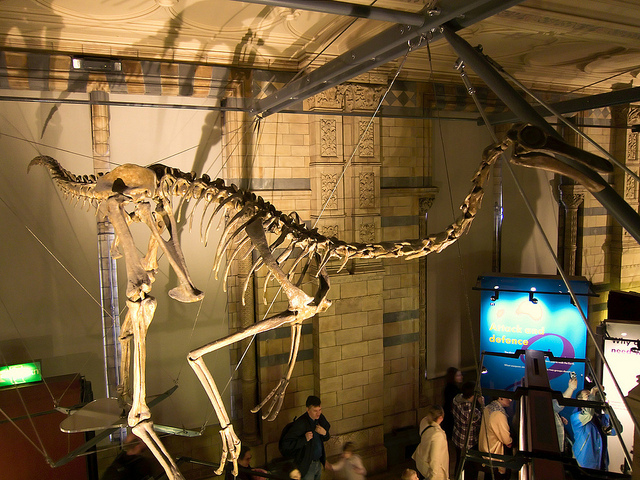 Ornithomimids are famous for—among other things—their lanky, elongated forelimbs. 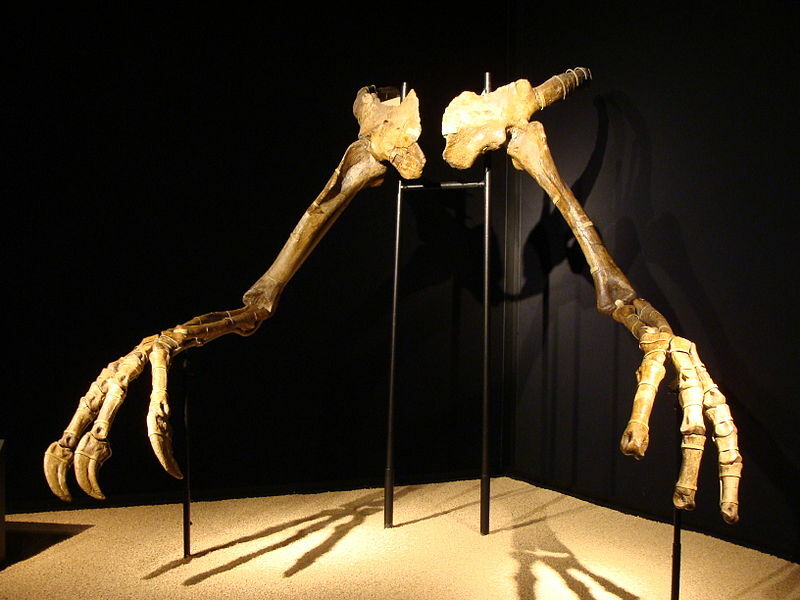 Yet Gallimimus’ arms, claws, and hands were proportionately short. This possibly means that the animal wasn’t as dexterous as its relatives, some of which likely grabbed tasty tree branches while feeding. 4. Some Ornithomimids Deliberately Swallowed Rocks. You’ll see a predatory avian busying itself by eating pebbles. What’s going on? Unlike us spoiled mammals, birds can’t chew. Naturally, this makes digestion somewhat difficult. So some feathered foodies help process their meals by swallowing tiny stones, which help mash up chow internally. 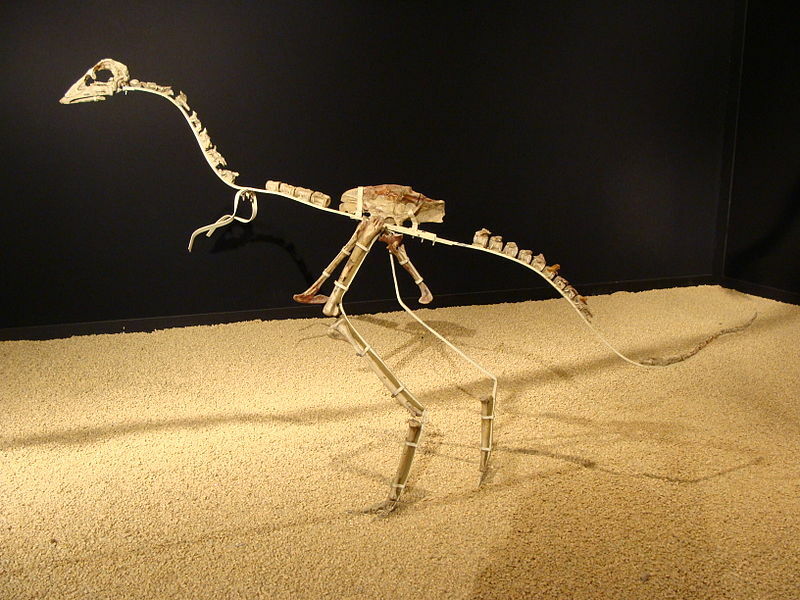 Fossilized stomach contents indicate that at least a few ornithomimids used this same technique. 5. Gallimimus Posed its Arms Very Differently than We Do. Can you touch the side of your arm with the side of your pinky finger? Probably not (and if you can, it might be time to seek medical attention). Dinosaurs like Gallimimus had wrists which would have allowed them to ace that little challenge. Like birds, their hands were built for flexing in this awkward direction. However, there’s a trade-off. Go outside and dribble a basketball. Now smirk with the knowledge that Gallimimus could never do this because its wrists were incapable of moving its palms to parallel the ground. Fellow humans, this calls for some gloating! 6. Jurassic Park Animators Got Up and Ran Around Like a Herd of Gallimimus Behind the Scenes. Over two dozen Gallimimus come racing towards Spielberg’s camera in this thrilling scene from the 1993 mega-blockbuster. To help visualize the sequence, Jurassic Park’s animation team members filmed themselves imitating these frenzied dinos while prancing through a studio parking lot. 7. Most Ornithomimid Names Aren’t Particularly Imaginative. Despite looking somewhat emu-like, Gallimimus’ genus name means “chicken mimic.” Its similarly-built cousins Pelicanimimus, Struthiomimus, and Ornithomimus have names which translate to “pelican mimic,” “ostrich mimic,” and “bird mimic,” respectively. 8. 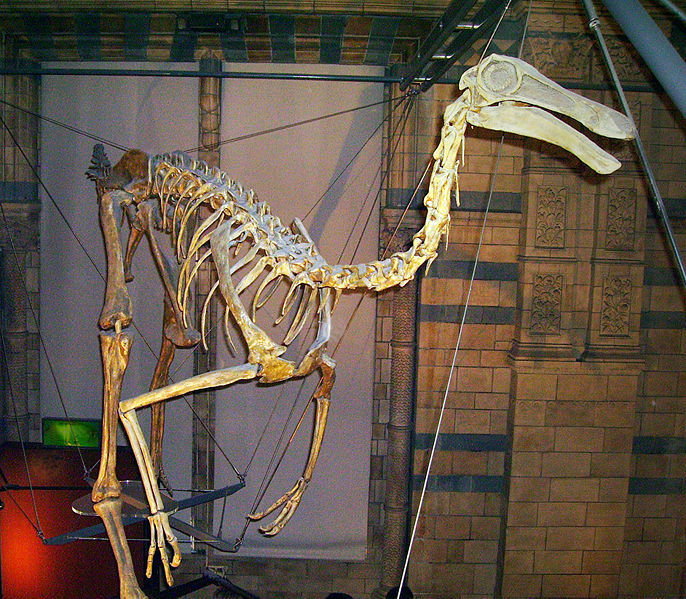 Some Scientists Have Argued that Gallimimus Ate Like A Duck. Soft tissue isn’t often preserved in fossilized skeletons, but a choice Gallimimus specimen found during the early 2000s gave us a nice look at this dinosaur’s mouth, and comb-like ridges were spotted near its beak. At first, these looked suspiciously similar to the straining mechanisms today’s ducks use while gobbling up small organisms in bodies of water. Gallimimus, it seemed, behaved likewise. However, the structures can also be seen in some herbivorous turtles, creatures which simply bite through foliage instead. 9. At Least Some Ornithomimids Had Primitive Wings. The feathered dino club just keeps getting bigger. 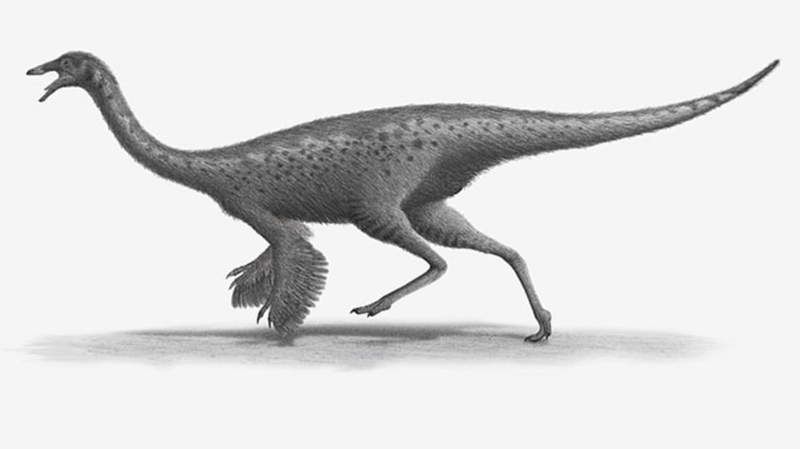 Ornithomimid skeletons complete with what appear to be enlarged arm feathers have been found in Canada. 10. 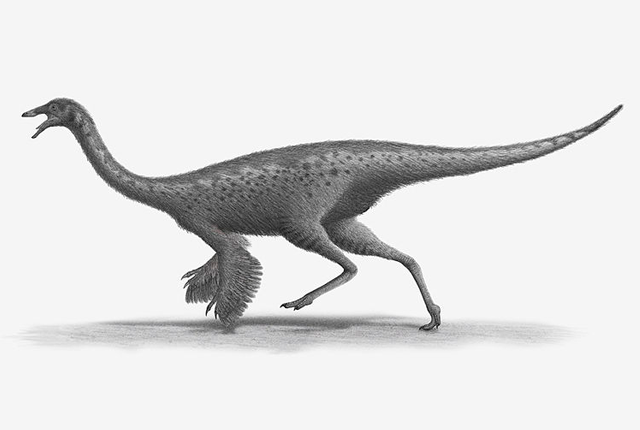 One of Gallimimus’ (Possible) Relatives Had Terrifyingly-Huge Arms.